The best performing Dirt Modified air filter is also the best value ! As well as many other outstanding Distributors and Retailers! Check our dealer listings to find your favorite resource. R2C filters feature a specially designed media that allows performance and efficiency to be restored to near new each time by simply using compressed air from inside out, making washing unnecessary to restore filter performance. R2C Pro Series filters feature a media that is fully compatible with washing. Biodegradable cleaners such as Simple Green or other mild shop degreasers can be used. Simply place the filter in a light solution or spray the cleaner on the filter. Allow the solution to loosen the particulate and then rinse thoroughly. Shake the filter or use compressed air from the inside outward to remove residual water and allow a full day or two to dry. While the media may discolor and become light gray, filter efficiency and restriction are not affected. Why do more successful Dirt Modified and Late Model teams rely on R2C race air filters than the others combined? In an effort to field a competitive race car, there's just too much to do other than to worry about air filter performance. Top teams rely on R2C race filters for maximum performance, not only at the start of the night, but throughout the race all the way to the checkered flag. No filter made today keeps engines cleaner and allows carburetors to remain dirt free, maintaining precision performance, maximum power and unmatched throttle response. You need the filter fresh for the feature? That's easy. Just use compressed air from inside-out and filter performance is restored to new levels time after time. No need to fool around with spraying glue on a filter in hopes of stopping dirt while driving in-race restriction through the roof. No longer is wasting money replacing loaded paper filters each night necessary. No race filter today can deliver the performance and engine protection that top teams get from R2C. No filter can match the value R2C filters provide savvy racers either. Other racers will know that you're serious about what you do and that you demand the best from your equipment when they see your engine equipped with the finest race filters ever designed for dirt cars. Stop asking street filters to do a job they were never designed for. Stop accepting dirt on your air cleaner base and on your carburetor boosters and bleeds. Get an R2C filter and watch it work. You'll never use anything else! The Best performing Dirt Modified Air Filters! Easier to remove dirt using compressed air. Washable too! The best dirt car filter ever produced is also the least expensive to use! Less that $2.00 per race! Whether it's a 4412 Holley 2 barrel equipped Dirt Modified or the highest horsepower open engines, racing, and winning, at this level demands a serious air filter. It's time to stop asking paper or oiled cheesecloth air filters to perform at levels for which these products were simply never designed. It's relatively easy to offer low restriction Modified air filters out of the box. Most competitive air filters significantly compromise efficiency and engine protection in order to achieve this flow capacity. The key to true dirt car air filter performance is not only low restriction when new, but maximum dirt stopping and dirt holding ability during events while maintaining low initial restriction levels until the checkered flag is waved. R2C Dirt Modified air filters offer racers unmatched engine protection and efficiency levels exceeding 99.7% while reducing in-race restriction by as much as 60%! This means better power production and throttle response while keeping carburetors clean and operating at maximum performance levels. 15 times the dirt routinely passes through gauze air filters when compared to R2C Dirt Modified racing air filters. 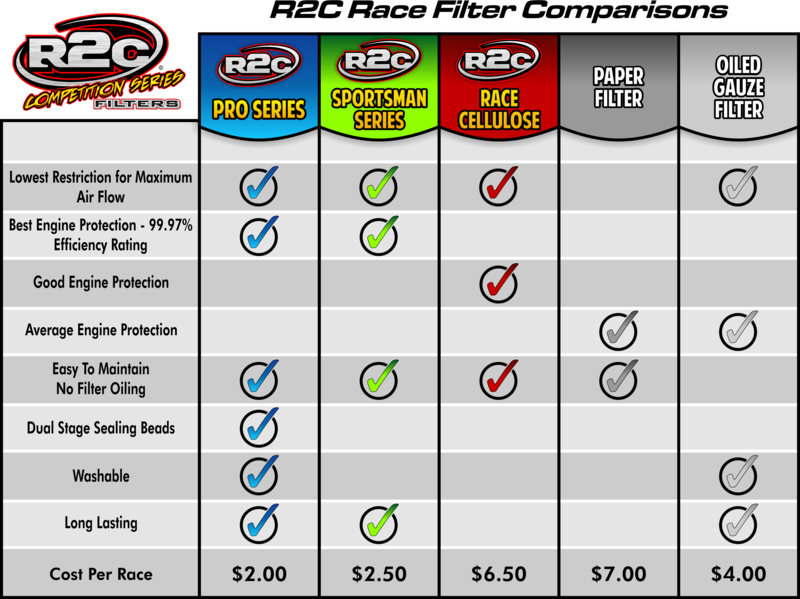 R2C Pro Series Dirt Modified air filters provide performance at the highest levels, race after race. R2C Dirt Modified air filters also save teams time and money! *While not often necessary due to the effective nature of compressed air cleaning from inside out, R2C performance synthetic air filters are washable and can be soaked in biodegradable degreasers such as Simple Green, etc. Shake or use compressed air to remove residual water and allow a full day or two of drying time. * R2C does not recommend using an air cleaner lid with filter media incorporated into it. There are multiple reasons to avoid this configuration. Protect your engine and carburetor while working in the pits or heading to the scales/tech. Convenient, one-piece unit attaches directly to the carburetor. Easy to clean and maintain.